3 Which materials make the safest helmets? 4 Who makes the safest carbon/composite/fibreglass/thermoplastic helmet? 5 Which is safer – a full-face or flip-up crash helmet? 6 Are the chin guards on modular helmets safe – or should I buy a full face helmet? 7 Which are the best performing full face helmets? 8 Which are the best performing modular helmets? 9 Which are the lightest helmets – full face or modular? 10 So which full face helmets are the lightest? 11 Are more expensive helmets better than cheap helmets? 13 Dull stuff. Assumptions, data, statistics and other stuff you really don’t want to know about! 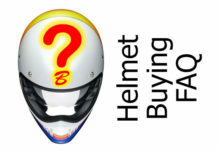 How do you buy your helmet? Looks? To match your bike/leathers? A brand you trust? Price? Probably a combination of some/all the above? Buying a helmet can be tricky because there’s not much information out there – and quite a lot of misinformation. And if you ask for advice on a forum or down the pub, there’ll always be some wise owl comes up with the phrase “If you’ve got a cheap head, buy a cheap helmet.” Hmm. We’ve found lots of great/safe helmets that don’t break the bank. So we wanted to get down to the nitty-gritty, using only real data uncovered by testing on real crash helmets bought off the shelf from real shops from a range of manufacturers. We also wanted to have a look at the different construction materials to find out which is best in terms of safety and lightness and find out who makes the best helmets. We wanted to cut out the hearsay and opinion and look at the cold hard facts. That way, when you’re looking for your next helmet, you’ll know where to start. Sounds easy. But where to get the data? Well, for all its alleged deficiencies, SHARP, the UK Government crash helmet testing facility (Safety Helmet Assessment and Ratings Program) is probably the best attempt to produce a standardized way of testing helmet effectiveness in a way that at least tries to replicate some of the conditions found in the real world. Of course, that’s easier said than done in a lab, but it does base its testing on the best real-world accident research and its methodology on ‘the best bits of current standards around the world’. Whether you agree or disagree with its methodology, at the very least it provides a way we can compare the performance of different helmets against each other. That alone has got to be useful. You can read how we got on when we went along to the SHARP testing labs in Manchester too. • Cheap versus expensive helmets. Is it right that the more you pay, the better the helmet? • Which brands produce the safest helmets? • Which materials make the safest helmets? • Who makes the safest carbon/composite/fibreglass/thermoplastic helmet? • Which are safer: full-face or flip-up crash helmets? 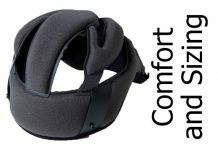 • Are chin guards on modular helmets safe or should I buy a full face? • Which are the best performing full face helmets? • Which are the best performing modular helmets? 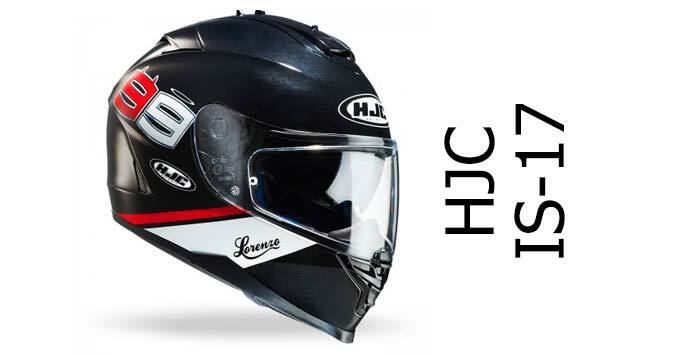 • Which are the lightest helmets – full face or modular? • Which full face helmets are the lightest? So, after a couple of days spend trawling data, filling in spreadsheets and running formulas (I’m fascinating to chat to down the pub me!) here’s what we deduced. SHARP test helmets and score them 1-5 stars with 5 stars being the safest. Only 50 out of 320 tested helmets have scored 5 stars (at the point we published this article), so 5 star helmets are pretty rare beasts. The most popular rating is four stars with 133 scoring four and the remaining 137 scored between 1-3 stars, with failing on the side impact test being the most common reason to drop stars (side-of-head impacts are actually as common as front impacts in most accidents). One other thing to note is that SHARP doesn’t test open face helmets as, common sense tells, they’re never going to protect you as well as a helmet that covers your face. Fair enough. We continually update our safest brands page as new data is released, and we only include manufacturers with a statistically-significant number of tests under their belt. But the top three overall are Bell, Caberg and AGV. Every single Bell full face helmet tested by SHARP has scored five stars so they’re going to be a difficult act to beat. To see how your helmet fares, check our top helmet brands page. Which materials make the safest helmets? Crash helmet shells are made from lots of different materials these days but it can be pretty unclear quite what your helmet’s made from if you read the manufacturer’s bumf. See the section on Assumptions for a more detailed explanation on how we broke the materials down – but in a nutshell, we’ve four different types of materials that makers claim to use; thermoplastics (including polycarbonate), fibreglass, composites and carbon (or carbon kevlar mix). 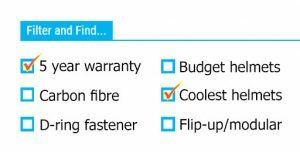 Yep there’s overlap there – fibreglass is a composite for example, but again these are the terms the manufacturers use so we’ll stick with them. Carbon or carbon/kevlar helmets score higher marks than other constructions. Next best is composite, then fibreglass then thermoplastic – though those final three are pretty close together with just an 8% difference in overall safety performance between them. The leap from composite to carbon shell means your helmet will be an average of 9.3% safer. Again, that’s not a massive difference especially when you bring in price differences – but that’s for later. If you asked most people, they’d probably say that carbon helmets will offer more protection – and they’d be right. But then the differences are pretty small with less a 17.3% overall difference between thermoplastic and carbon helmets. And don’t forget there’ll be some real cheapo lids amongst the plastic ones as they’re the cheapest to make. Who makes the safest carbon/composite/fibreglass/thermoplastic helmet? OK we’ve mentioned the best brands overall, but what about by helmet type. In other words, if you’re in the market for a particular type of helmet construction, where should you look first? Surprisingly, Marushin came out joint-top with Bell helmets. That’s surprising because Marushin tend to produce helmets towards the cheaper end of the market, but both manufacturers scored five stars for their carbon lids. However, both also only had two helmets tested so it’s not the biggest of samples. On the other hand Shark had seven carbon helmets tested and scored an average of 4.6 stars with none scoring lower than four. So we’d say if you’re looking for a carbon helmet and want a decent range of designs to choose from, Shark are probably the brand to check out first. Most non-plastic helmets are composite materials of course, but some manufacturers only describe their helmets in this very vague term. In reality, it might not matter that you don’t know what the composite material is made of as long as it does its job; it could be constructed from old car tyres and wood glue, but as long as it lasts long enough and protects your head in an accident then that’s arguably all that matters. Here, AGV is the king of composites with three helmets scoring a maximum five stars, closely followed by Bell (again!) scoring 4.7 then Shark (4.4) then X-Lite on (4.3). 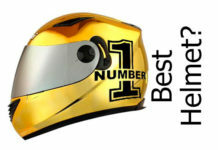 AGV did best again – with 7 helmets scoring an average of 4.3 stars which is a great performance. Next was Shoei‘s first entrance into the study scoring four stars across 8 helmets. Note that as we’re coming down from Carbon to Composite to Fibreglass, the average scores are dropping – although we’d say that four stars out of five still represents a very good score and a safe helmet. Across 109 polycarbonate helmets, the average SHARP star rating was 3.33 out of 5. Which isn’t bad because there’s some real humdingers in there scoring one star and dragging the average right down. However when you look at individual manufacturers, then of the 6 Caberg Polycarbonate helmets tested, they scored a staggering average of 4.8 out of 5. Both Grex and Nolan (both part of the Nolan Group) scored an average of 4 stars along with Shark. That’s an average score remember – Lazer was doing well with a couple of thermoplastic helmets that scored 5 stars but their overall score was pulled down by one helmet that scored just 2/5 stars. So there you have it. As expected, carbon fibre-based crash helmets are safer than helmets constructed with other materials. But as pointed out above, though carbon helmets broadly perform best, followed by composite, fibreglass then thermoplastic, there are helmets within each category that score maximum points so the answer’s not entirely clear-cut. Full-face or Flip-up (also called modular or system – we’ll use the terms interchangeably here)? Since their introduction, the popularity of flip-up helmets has been on the rise. They’re handy if you like the idea of riding with an open face from time to time. Or like to chat to folks without removing your lid. Or to show your face. Or indeed to have a quick ciggy or coffee without de-lidding. But how safe are they – and how much heavier than the equivalent full face? Which is safer – a full-face or flip-up crash helmet? Across all the SHARP test data, 133 full face helmets scored and average of 3.55 stars, against 65 modular helmets scoring 3.33. Meaning your average full face helmet is a tad safer – 4.4% safer if you want to be precise. Which isn’t a great deal, especially when you take into account the massive variance in performance of individual helmets anyway. Are the chin guards on modular helmets safe – or should I buy a full face helmet? The issue is with the chin guard which has a reasonably high chance of springing open in response to an impact. SHARP notes the percentage of times the chin guard remained fully locked for each flip-up helmet test. We’ve done the number-twiddling and the average works out at 77% – meaning on average 23% of the time your chin guard might come unlocked (not necessarily open), leaving your face potentially open to injury. The technical expression for this is – eeeek! You can read more about the SHARP chin guard test in our article about visiting the SHARP helmet testing labs. Of course, there’s a wide variation in how helmets perform in this regard – the best performers stayed locked in every test, while the worst performing managed to stay locked just 17% of the time! Which are the best performing full face helmets? Bell helmets scored highest with straight five out of fives right across the board with all seven of their full face lids. Marushin, surprisingly, came second scoring an average of 4.8 stars. You might have trouble finding either of these brands though and some of the helmets are discontinued, in which case try third place Caberg with an average score of 4.6. For details of which individual full face models are worth looking at, check out our top 5 full face helmets list. Which are the best performing modular helmets? 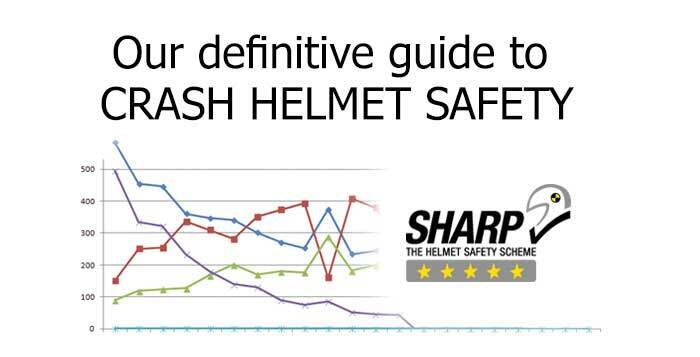 Looking at SHARP star ratings alone, Caberg wins, scoring 4.7 stars out of 5 across 6 tested helmet models. Second were AGV who scored 4.4 stars across two helmets, followed by and Grex, Nolan and Lazer all scoring four. However, if we look at brands where the chin guards stayed closed, then the winners are different. Nolan Group manufacturers (that’s Nolan, Grex, G-Mac and X-Lite) win out with Nolan having a 100% of their flip-up helmets staying shut throughout all tests (four different models tested). Grex too scored 100% with both their helmets. Caberg stayed closed a decent 89% of the time (6 helmets tested) with Lazer on 85% (4 helmets tested) – all comfortably higher than the flip-up average of 77%. In essence then, full face helmets are generally a little safer than modulars but some modulars are just as safe. Clear as mud and, as always, the devil’s in the detail because all helmets are definitely not created equal. Where possible, we’ll report the % of times a flip-up’s chin guard stays closed on our reviews and, as you’d expect, those which score highly here will score higher marks than those that pop open. Which are the lightest helmets – full face or modular? Which is arguably not a massive difference or deal-breaker for most of us? Of course if you had an orange strapped to your helmet, you’d feel some difference, especially if that orange was placed to one side – which can be the sensation you get when you open up a modular’s chin guard because the weight of the guard shifts and which can make the helmet feel a bit unwieldy. However, we did find one modular that weighed as little as 1.3K showing there are some very light flip-ups if you look (though it didn’t do so well in safety ratings). In general, when a modular scored well in terms of safety and the chin guard staying locked, it did weigh roughly the average weight figure of all modular of around 1.7Kg, possibly showing it needs a certain amount of solid (i.e. weighty) components to keep it safe. So yes, we’d agree that like-for-like, a flip-up helmet is heavier than a full face. So which full face helmets are the lightest? That’s an average difference of, yes a medium sized orange again (or 210 grammes if you want to get technical). Not a massive amount when you consider the possible cost differences (don’t worry, that bit’s coming soon!). So yes, carbon helmets tend to be the lightest but again, it’s a law of diminishing returns and if you’re looking to balance all the factors, safety, lightness, price (as well as some others that SHARP doesn’t cover but we do in our reviews, such as comfort, build quality, quietness etc. etc. – check our tag cloud somewhere to the right to see helmets that perform best for these criteria) which most of us are when buying a helmet, then things aren’t so clear-cut. Are more expensive helmets better than cheap helmets? As usual, the answer is yes and no. If you look at it that carbon helmets generally perform better than thermoplastic helmets and carbon helmets generally cost more than thermoplastic helmets, then you could say it’s a ‘yes’. And in fact when you look at the data, almost all carbon helmets produced by the better known brands do perform extremely well (four stars or higher) with just one or two exceptions. But the story is much cloudier when you get into composite and fibreglass helmets. Here, there’s such a range of safety scores that it’s impossible to make such sweeping generalisations and you really need to look at each individual helmet or look at the average scores across brands, as we’ve done above. There’s also a huge range of prices – from your entry-level £29.99 thermoplastic helmet to your top of the range composites around £550. The cheapest SHARP 5 star rated helmets can be had for around £60 by the way, so you could easily argue that no, the best helmets are the cheap ones if you were so inclined. There are some general rules of thumb that you might be able to apply when you’re looking for your next safest/lightest/best value helmet. If you’re on a tight budget, a thermoplastic (polycarbonate) shelled helmet is fine. There are some really safe and reasonably light ones about. Check out AGV first. Some expensive helmets are poor. Some cheap helmets are excellent. Expensive doesn’t necessarily mean good. If you want a really safe modular helmet, you need to be careful. They do exist, but shop wisely and probably check out Nolan, Grex, Caberg and Lazer first. Dull stuff. Assumptions, data, statistics and other stuff you really don’t want to know about! As anyone who knows the remotest things about statistics will tell you, 56.25% of statistics are made up and the rest use incomplete and conflicting data sets. Probably. Or should that be probability? While SHARP data looks pretty good – in fact about as good as it gets for motorcycle crash helmet data – for our purposes it is slightly flawed (as indeed might be some of our analytical approaches). Firstly, some of the data’s old (SHARP began publishing data in 2010) and relates to helmets that are no longer available. Which, if we’re looking to find out information to guide us with purchases of new helmets (which we are) might be misleading. And of course past performance will never truly reflect future performance; however we do take into account safety trends uncovered by the most recent helmet tests in some of our reviews where safety data isn’t available. So for this article, the analysis we’ve done does take into account that a manufacturer’s products might be improving and scoring higher more recently. So where we’ve scored a brand overall higher than another, we will take into account recent helmet safety ratings. But if we’re looking at overall data on, say, composite helmets by a manufacturer, then we look across all helmets tested over time. 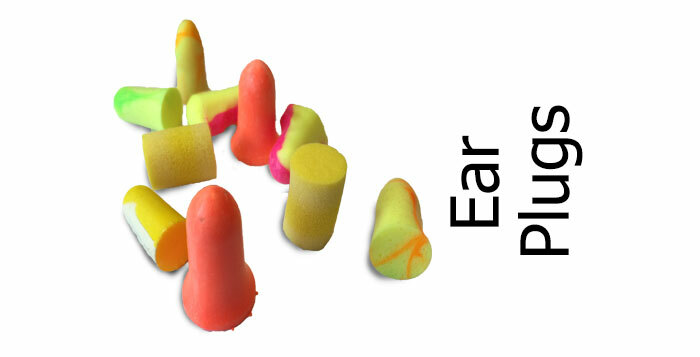 Next, the materials definitions are open to interpretation. SHARP use the material names given to them by the manufacturer, but each might well call it something different. Hence some that call a material polycarbonate, others will call it thermoplastic. Same for fibreglass or composite. So we’ve lumped some together where it seemed appropriate and left others alone where it didn’t. Which means we merged data on thermoplastic and polycarbonate and carbon and carbon Kevlar into one category name, but left composite and fibreglass alone (fibreglass is a composite but the term composite could include lots of other construction materials too). There’s flaws in doing this of course, but then you could argue if a manufacturer calls it a composite helmet and you buy it as a composite helmet and refer to it as one, then the analysis still stands. Thanks for reading – and please share to help get the info out there!